A second garment upcycling transformation for a black, semi-transparent halter top. This time, the simple top became an elegant garment with lace and fringe details. This DIY halter top is perfect for social gatherings and dance parties! 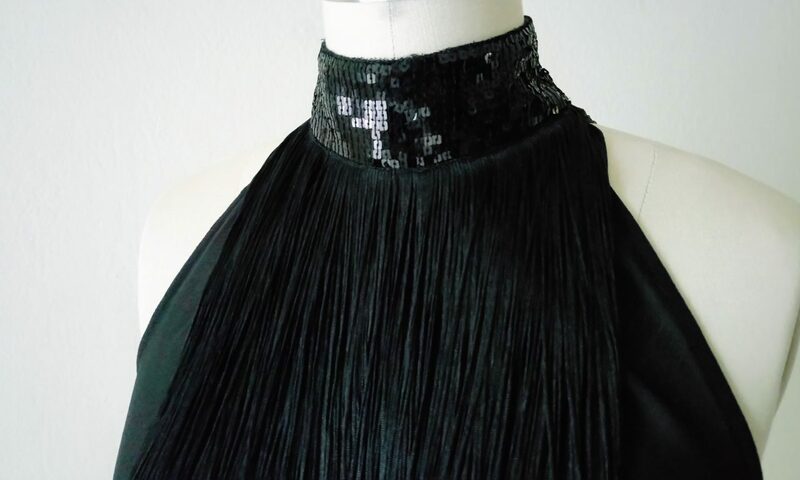 The main materials for this DIY Fashion project were an old H&M halter top, 18″ long black fringe trim, sequin trim, and scraps of lace remnants. Needle and thread completed the supply list. This project was 100% done with hand sewing. Read more about this project by visiting DIY Halter Top with Fringe, Sequin, and Lace Embellishments post. A semi-transparent halter top embellished with fringe, sequin, and lace trims. A second upcycling transformation, after first upcycled as a halter dress in 2014.